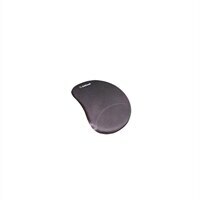 The organically-shaped mouse pad (mousing platform) with it's beveled edges and sloped surface keeps the arm and hand in a more natural, more relaxed position than a conventional flat mouse pad or desktop mat. Made of stress-dispersing gel, the mousing platform gives under pressure to relieve strain and the lycra cover provides excellent trackability. It helps you attain neutral wrist postures.